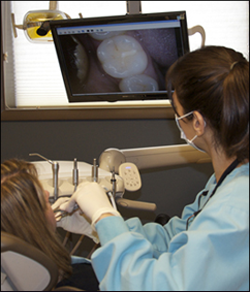 Intraoral cameras are an excellent means of allowing the patient to view potential dental conditions in their own mouth. It is much easier to understand what is happening in your mouth if you can see the problem on a computer monitor. This digital image can be utilized to provide information to insurances and other doctors if necessary. Our Dental Videos page contains video information about our services. "Love the smile you're in!"